Some kids thrive with traditional learning. They enjoy writing in journals, completing math workbooks, and reading independently. Yet others find these tasks tedious and laborious. Lucky for them, there are many great games to play that make learning exciting and engaging, while still building key academic skills. Try the ideas below for loads of laughter and learning. Bananagrams is an engaging game that both kids (ages 7 and up) and adults enjoy playing, and it helps strengthen reading and spelling skills. A series of letter tiles are contained in a banana-shaped bag and players compete against one another to use up their tiles by creating crosswords with their letters. When a player has a letter she wants to get rid of, she exclaims “dump”, returns the letter to the main pile, and takes three new ones. Once a player has used all of her letters in her crossword grid, she shouts “peel!” and all the other players must pick another letter tile. Get ready for hours of fun with this game! Sump Swamp is a great game for building basic addition and subtraction skills. Kids will learn their math facts without even realizing it! ‎With this board game, players progress through a “swamp” by rolling dice and answering addition and subtraction problems. It’s helpful to land on the Crocodile Short Cut for a quicker route, and players try to avoid the Endless Loop, which can set them back on their journey through the “swamp.”‎ Kids will achieve automaticity with their math facts in no time! When children read, they will inevitably come across words that are not decoadable, meaning they can’t use their phonics skills to sound them out. These types of words, called sight words, simply need to be memorized or recognized visually, and Zingo Sight Words is a great game for exposing kids in grade prek-2 to sight words they will need to learn, while still having lots of fun. ‎ Zingo is played like the popular game Bingo, where each player is given a card containing nine squares, each with a different sight word. The “announcer” pulls a sight word tile from the dispencer and reads it aloud. The first player to claim he has that sight word on his card gets the tile, and the first one to complete their card with nine tiles wins! Learning to properly sequence events in a story is an important foundational reading skill. ‎What Happens Next? helps build this critical skill for kids ages 3 and up in puzzle format. To play, children must put together fourteen sets of three piece puzzles in proper order to correctly complete the sequence. To develop vocabulary, speech, and story telling skills, encourage your child to explain what happened in the story once she completes the sequence. For older kids, encourage them to write down the events of the story in sequential order using proper capitalization and punctuation to help develop important writing skills. Many kids struggle with writing, and some downright dread practicing this skill. Help make writing fun and engaging for your child by playing with Rory’s Story Cubes. This game comes with nice dice cubes, with each cube containing six images. Players role all nine cubes and create a story containing all of the images rolled, starting with “Once upon a time…” Kids can play alone or in groups; if played in a group setting, it’s fun to vote on the best story once each player has completed their turn. Let the fun, creativity, laughter, and good times roll! Learning does not need to be boring or tedious. 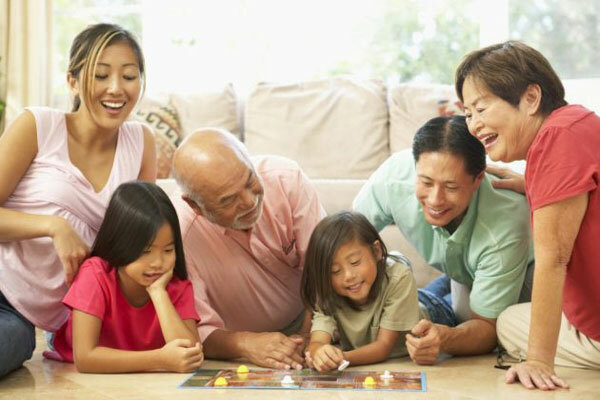 Enjoy special time with your child while building key academic skills with these games. He won’t even know he’s learning!